These mulberries come from a large tree that shades part of our greenhouse. We only have one of these trees and it bears fruit for about three weeks of the year. This year we are fortunate to have a large enough quantity of berries for our CSA members to have a little taste. The immature fruits are white, green, or pale yellow at first and they turn pink and then red while ripening. When they turn a dark purple or black they have the sweetest flavor and are fully ripe. 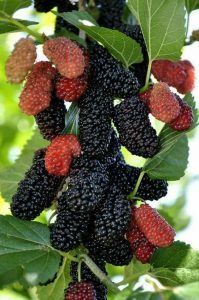 We pick them once they are fully ripe so they will be pretty tender and fragile by the time they get to your kitchen but rather sweet and ripe than sour..trust me you don’t want an unripe mulberry. BEWARE, THEY STAIN EVERYTHING!! They have such an intense, easily extracted coloring that they are increasingly popular as a natural food colorant. Toss a handful in your salad or use in salad dressing, stir them in some lemonade, sprinkle over your breakfast yogurt and granola, or add to your batter for some delicious and colorful baked goods. Too mushy? Create a mulberry sauce to drizzle over your ice cream. The berry has a little thin green stem that runs through the berry from tip to tip. Go ahead and eat it, it won’t hurt you, in fact it’s down right good for you and it’s also a pain to try to remove. You probably wouldn’t even know it was there unless I mentioned it. Enjoy this special treat from the farm! Interesting Fact about the Mulberry Tree.. 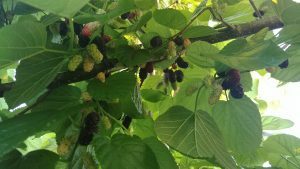 Some North American cities have banned the planting of mulberries because of the large amounts of pollen they produce, posing a potential health hazard for some pollen allergy sufferers. Conversely, female mulberry trees produce all-female flowers, which draw pollen and dust from the air. Because of this pollen-absorbing feature, all-female mulberry trees are considered “allergy-free”. 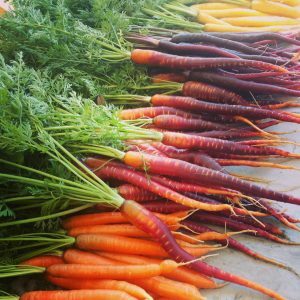 Rainbow Carrots- You know it’s spring when you open up your share to find beautiful feather like fronds on the tops of your multicolored carrots. Makes sure to cut the tops off of your carrots as soon as you get them home, this will help prolong the life of your carrot. Don’t throw those beautiful, luscious green tops away, use them as you would parsley, in chimichurri or try them in some carrot top pesto using the spinach in your share (there are several variations). The name Kohlrabi comes from the German “kohl,” meaning cabbage, and “rabi,” meaning turnip—and that kind of says it all about this delicious vegetable. It’s flavor is that of it’s namesakes and has also been describe as having a similar taste to a stem of broccoli. Don’t be perplexed about this purple alien-like vegetable in your share, it’s really quite versatile and can be cooked similar to a potato or eaten raw – it’s crispy like an apple or a Jicama. To prepare simply cut off each leaf at the base of the stem where it is attached. Then you can peel them using a vegetable peeler, or chop off the outside rind to get to the crisp and ready to eat, inside. 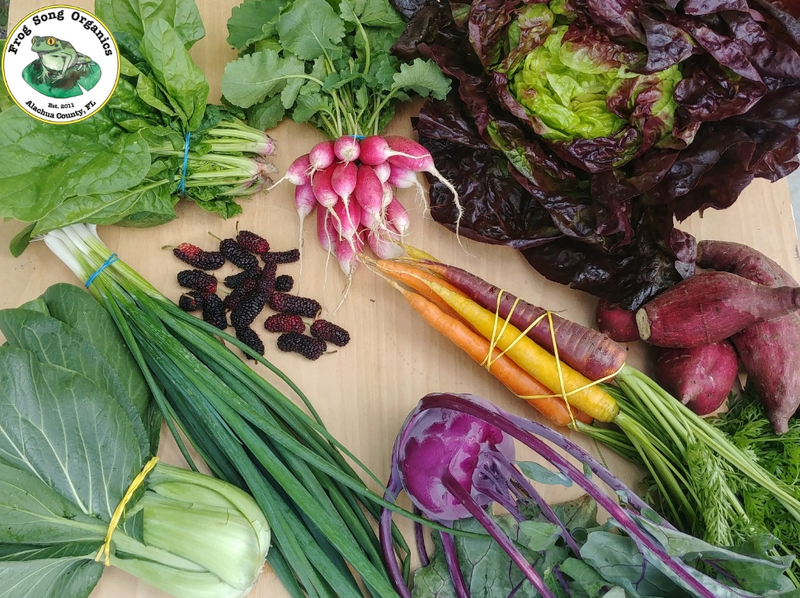 Once the outer rind is removed you can cut the kohlrabi bulb according to your recipe: shredded- most common for salads, cubed- for stews and roasting or pureed for soups. Quick Kohlrabi and Carrot Gratin with scallions (this recipe is in German but my computer translated it for me.. I tried to find a english version to share but I had no luck, I will try to try to translate it and post the recipe). 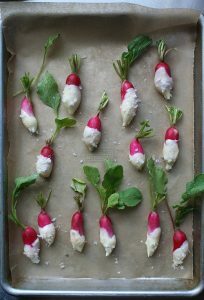 French Breakfast Radishes: Slice them and toss them in a salad or snack on them whole. My favorite way to eat these radishes (or any kind of radish) is on top of toast. 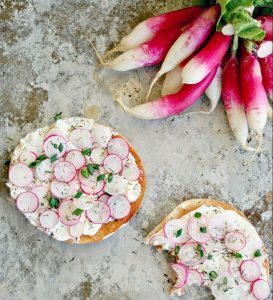 I’m a radish toast connoisseur if you will, always on the lookout for new ways to combine my favorite things: Radishes, bread, butter and salt. Try this recipe using the scallions in your share and some fresh dill from past shares. Spinach- A Special Treat! Spinach is an extremely difficult crop to grow organically in Florida due to its susceptibility to mildew and precise germination temperature. Spinach is affected by many different strains/races of downy mildew. In conventional agriculture they spray it with fungicides every week or more often to combat the mildew. The seeds also require cold weather to germinate and the plants won’t grow if the temperature gets over 80º. Eat it fresh in a green salad, add it to your morning eggs, or blend it up and put it in your smoothie, there’s no wrong way to eat Spinach- just ask Popeye. Red Butter Lettuce- It’s large tender leaves are perfect for lettuce wraps, make sure to wash the head of lettuce once again before you eat it. Bok Choy- Chinese cabbage, great for stir fries and soups. Store bok choy in a sealed plastic bag in your produce drawer for maximum shelf life. Spring Onions– Are great as a garnish on casseroles, on toasts, sprinkled over eggs or in salads. SAVE THE SCRAPS! Onions are one of the easiest vegetables to regrow. 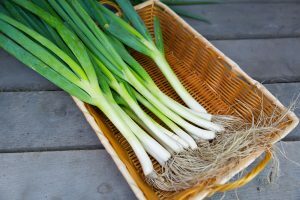 Simply chop them up leaving at least 1-1 1/2 inches at the end of the stem (white part) and put the ends in a jar of water or moist soil, they will sprout some little roots and then you can plant them in your windowsill garden or yard and they will grow you a little spring onion.